Our second S/S range is Regal Jewellery. Make like royalty this Spring and dazzle in opulent, awe-inspiring jewels and cameos. This collection might have been inspired by a certain royal wedding just around the corner, but here at Chelsea Doll, we've never really needed an excuse to wear decadent, eye-catching jewellery! Here's a highlight of some of our faves from the collection. 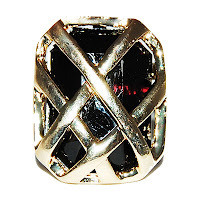 We love this Jewel Lattice Ring. Such an unusual design and so in-keeping with the current 70s' trend, it really does let your hand do the talking! Priced at a wallet-happy £8, we think it's a brilliant way to make a statement. 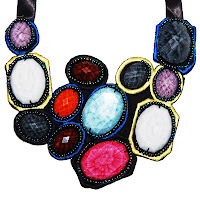 Our Multi-Colour Stone Bib Necklace is just the piece to brighten up a white t-shirt. With a vast array of colourful, mis-shaped stones, we can't stop looking at it! A definite hit for this season's neon trend too and at just £12, an investment piece. 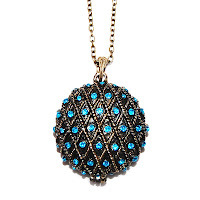 This Blue Jewel Treasure Locket is gorgeous in antique gold, decorated with blue crystals (there's a pink one too!). It would look super with a chiffon shirt, to add a bit o' sparkle to a cool, understated look. It's priced at £12, so will definitely become a jewellery box fave! 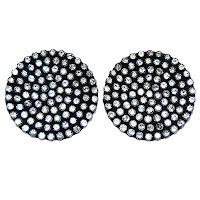 So much crystal, and these Deco Crystal Circle Earrings, are definitely no exception! Everyone needs a pair of WOW earrings in their accessory collection. These are absolutely stunning and we think they should be teamed with an off-the-face hair do, to release their full potential! Priced at just £8, they're the perfect way to spruce up an existing outfit!